It's only been 3 days since Apple watchers discovered signs of a split-screen multitasking feature in the not-yet released iOS 8, and a hacker has already gotten the code to work. 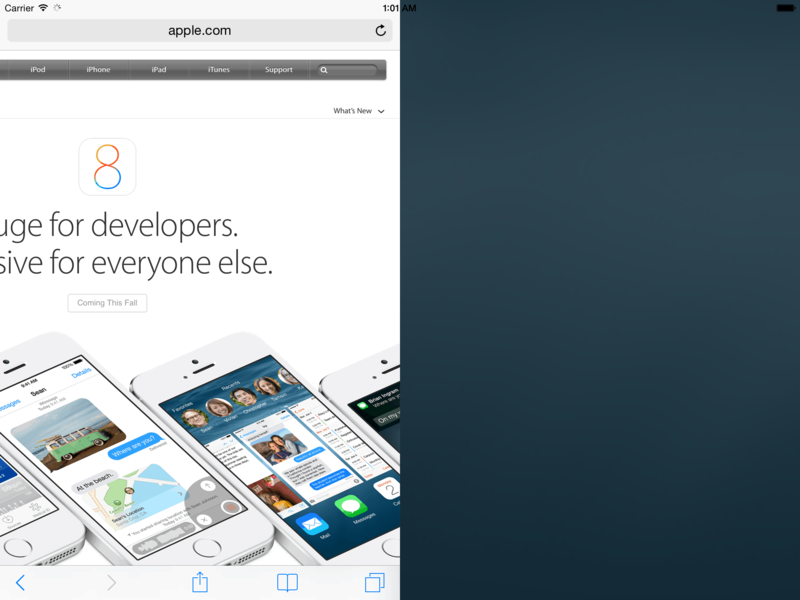 Developer Steven Troughton-Smith has hacked the iOS 8 iPad simulator and kinda sorta got the feature working. As you can see in the video below, he can get the simulator to display an app which takes up 25%, 50% or 75% of the simulated iPad's screen. The rest of the space is probably going to be used by a second app, but enabling that second app and displaying it is still a work in progress. The video also shows that it's possible to move and resize the window using a 2-fingered gesture, though of course that gesture might not make it into the release version of Apple's multitasking feature. Due to this being an unannounced feature in iOS 8, there's no word on when it might be officially released. If we're lucky Apple may add it to the initial release of iOS 8 this Fall, but there's no guarantee that will happen. Even so, this is a good step forward for Apple. They are adding a much needed feature which will help iPad owners make better use of their very powerful tablets, and what's more Apple is only about 12 to 14 years behind the tech curve on this one. As you might know, Samsung and Rockchip have each deployed a similar multi-window features which are in some ways better than Apple's trick, and the open-source firmware CyanogenMod has also incorporated a multi-window feature. And then there is Microsoft, which offered this type of multi-window and multitasking feature over a decade ago. Windows CE, which was then a cutting-edge mobile OS, enabled users to have not just two but a dozen or more windows open at once, including overlapping windows. Microsoft's solution didn't look as nice or work as well as Apple's, but what MS lacked in prettiness they made up for in usability. Windows CE was the next best thing to a desktop OS which could be run on mobile devices, in particular ones which sipped power instead of guzzling it. In a way WinCE grew out of the same design precepts as Windows RT, only in the case of the older OS the focus was on developing more capable PDAs, handhelds, and embedded systems rather than taking a desktop OS and cutting back on abilities. Yes, I do still miss Windows CE; why do you ask?